There had been much anticipation heading into the 2011 MLB All-Star Game at Chase Field. On Tuesday, baseball’s Midsummer Classic finally arrived. For the second-straight year, the National League emerged victorious. Behind a towering fourth inning, three-run homer off the bat of Brewers first baseman (and eventual game MVP) Prince Fielder, the home team cruised to a 5-1 victory over its MLB counterparts. In addition to Fielder’s bomb, the National League pitching staff held the AL lineup to just one run while scattering six hits. Red Sox first baseman Adrian Gonzalez provided the lone big hit of the evening for the American team by lacing a solo home run in the fourth. Both D-backs representatives appeared in the game, much to the delight of the hometown crowd. 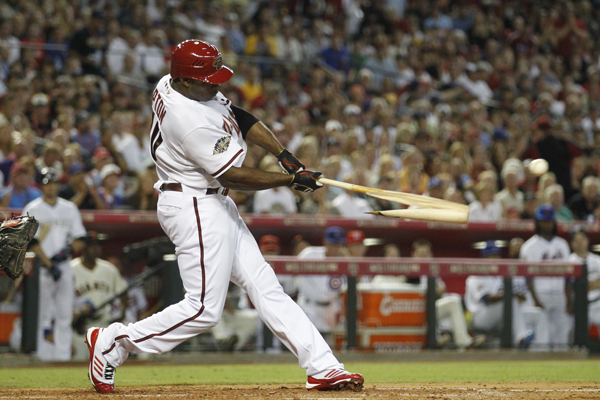 Two-time All-Star Justin Upton took over the right field duties in the top of the fourth until being replaced in the ninth, while Miguel Montero entered in the top of the ninth and caught the final frame. The hometown crowd showed its immense appreciation for both D-backs by giving several ovations when the players were announced. The D-backs’ backstop was also thrilled to have a teammate and manager Kirk Gibson with him on the team. Montero did not receive an at-bat in the game. He was standing in the on-deck circle when the final out of the eighth inning was recorded. Upton, meanwhile, went hitless in two at-bats with a pair of line outs to go along with a putout in the field, 24 hours after playing spectator for the State Farm Home Run Derby. While Montero didn’t hit, he did catch both Pirates closer Joel Hanrahan and Giants hurler Brian Wilson in the ninth. Things got dicey after Carlos Quentin and Matt Joyce reached scoring position safely. With one out, Wilson entered and promptly retired Michael Cuddyer on a fly out. Wilson sealed the National League win by inducing Paul Konerko into a game-ending groundout. Despite the scoring threats, Montero was excited to be out on the field catching. In the end, both Upton and Montero relished the chance to not only play in the All-Star Game, but to do so at Chase Field.